I am currently on vacation in Saint Malo, in the french region of Bretagne. One of the main touristic attractions of this region (and of France) is Mount Saint Michel, an old abbey set onto an Island in the Bay of Saint Michel. You can visit Mont Saint Michel per car, or take, as we did, busses and trains – I do not advise to do so, as it was rather difficult to do so, as the french company, that organizes this (Ligne Baie) was not organised at all, and left people behind after the bus was full (and they were aware of that in the morning). Mont Saint Michel itself is a gem and a great place to visit and I do advise everyone in the region to go to the place. You should not miss out on the Abbey on the top of the mountain, as it is the highlight of the visit. You will queue for some time, but after you entered the Abbey people will quickly disperse and it is a joy to be there. You will have some excellent views over the bay and the rooms in the Abbey are interesting as well. We decided to not visit the other museums on the Mont and instead made a walk around the island during low tide, which was another highlight of the day. Mont Saint Michel – one of the landmarks of France. On top of the island, just in front of the main church of the Abbey. Eating and drinking at Mont Saint Michel is something that can get rather costly, so you might consider to do it the “french way” . A lot of visitors from France had some sandwiches with them and were picnicking at some of the nicest places of the island: next time I will do this, too. I am sorry about the lack of updates on heartlandeurope.com but as I am working as a journalist in Austria I decided to concentrate on my journalistic work in german. Moreover I run another travel blog in german, together with my wife, which consumes most of my times. She is a great photographer and if you want to see more pictures of our visit to Mont Saint Michel please visit our article at wundrig.at – “Ein Tag am Mont Saint Michel”. You can also find a lot more articles about our holidays in the Bretagne. Paris, the City of Light, is one of the most popular tourist destinations in Europe. The entire city is practically a landmark, but there are several key attractions which stand out and should be on every visitor’s must-see list. 1.) The Eiffel Tower – Known as the Tour Eiffel by locals, the Eiffel Tower is perhaps the most iconic site in Paris. Trips to the top require a large amount of patience and come with a big price tag. For many tourists these points are not a deterrent, but if you’re on a budget or if you’re short on time, then you should consider experiencing the Eiffel Tower from the outside. There are several grassy areas available in which you can lay down and take in a stunning view of the majestic landmark. 2.) Paris Catacombs – If you enjoy learning about history in a slightly macabre context, then a trip to the Paris Catacombs is definitely recommended. You’ll descend down 130 steps to reach the Catacombs, where you’ll be greeted by an artistic display of the skeletal remains of millions of ancient Parisians. The Catacombs are great for a hot summer day, as the temperature is much cooler when you go that far below the surface. 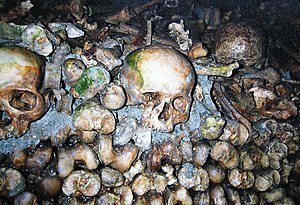 The photo above shows a typical view from the Paris Catacombs. 3.) Louvre Museum – The Louvre is an art museum which houses some of the most extraordinary works of art that the world has ever seen. Highlights include the enigmatic Mona Lisa and pieces from Raphael and Michelangelo. The Louvre is the most visited museum in the world, and after a day spent within its walls you’ll easily understand why. The photo above shows the entrance to the Louvre Museum, Paris. 1.) Getting Around Town – The Metro is an extremely efficient way to travel while you’re in Paris. If you’ll be using the Metro a lot, then you should consider purchasing a carnet, which is a bundle pack of ten tickets. Please note that the automatic Metro ticket machines in the main train stations sometimes have difficulty accepting American credit cards. 2.) Accommodations – Renting one of the many available holiday apartments in Paris is a fantastic way to save money while also experiencing the Paris lifestyle. If you’re looking for more space, there are also several French holiday homes to choose from. With a fully equipped kitchen you’ll be able to prepare your own meals, and you can take a picnic with you when you go to look at the Eiffel Tower. Having a picnic with the iconic landmark in front of you will be a memory that you’ll talk about for years to come; for a romantic twist, have a picnic dinner as the sun is setting. 3.) Free Museum Day – Most Paris museums offer free admission to visitors on the first Sunday of the month. Lines can be extremely long, especially at the Louvre, but if you’re on a budget and you’re able to get in line early in the day, then the savings can be well worth the wait. 4.) Take to the Streets – To truly experience Paris you should definitely spend some time walking through the city’s streets. Taking a stroll along the River Seine is particularly beautiful, and you’ll also encounter several of Paris’ talented street performers. By following these tips you’re certain to have the vacation experience of a lifetime. Paris is truly unique, and the more time that you plan for your visit there the better, but even if you only have one day Paris is definitely worth visiting.